RK Vardar Skopje extended winning run in regional SEHA GAZPROM league by beating an old rival – PPD Zagreb 32:31 (19:16). 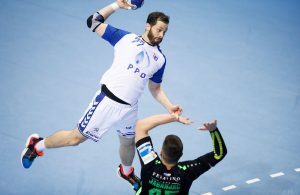 Only three days after they beat Telekom Veszprem, Macedonian champions took another big handball scalp of the team led by their ex-coach Veselin Vujovic. PPD Zagreb were in the match almost until the final whistle, but Raul Gonzales boys didn’t let Croatian team to make turnover. The last time result was balanced on 22:22 in 39th minute, after that Karacic (8) and Dibirov (7) took control over the match. Stipe Mandalinic netted nine goals for PPD Zagreb.